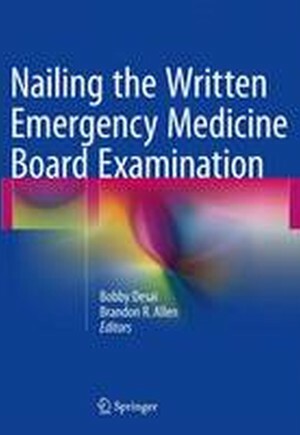 This book is a comprehensive and up-to-date study guide for those preparing to take the written emergency medicine board examination. It serves as a concise text of emergency medicine. It is distinguished by a problem-oriented approach and is presented in a visual and easily comprehensible format. The reader is walked through how to arrive at the diagnosis for each potential emergency situation, with each diagnosis or problem broken down into signs, symptoms, workup (labs and imaging), and disposition. This useful guide captures the latest developments in emergency medicine, including the newest technologies and methodologies, such as ultrasound, and simulation, which are becoming an increasingly important part of emergency medicine education and practice, as reflected in the board exam. This is an ideal tool for emergency medicine residents and faculty, critical care trainees, physician assistants and nurses working in emergency medicine, and medical students. Cardiovascular Emergencies.- Pulmonary Emergencies.- Gastroenterology.- Nephrology & Urology.- Hematologic & Oncologic Emergencies.- Disorders Affecting the Skin.- Endocrine/Metabolic/Electrolytes.- Ear, Nose, & Throat.- Environmental Emergencies.- Neurologic Emergencies.- Obstetrics & Gynecology.- Ophthalmology.- Toxicologic Emergencies.- Orthopedic Emergencies.- Trauma.